Before I was born my parents had a pair of black girl cats. One of them moved out when my brother came along a couple of years later – clearly I was more than enough children for it to decide it was not suited to a family household! The one who remained was more tolerant and put up with being carted around, cuddled and loved in the way that only a small child can love a pet… she died when I was about 10 and I recall being utterly inconsolable, my first real experience of bereavement. I cried for weeks, was taken out of assembly at school in tears when a poem about a cat was read out and mourned her for a really long time. As soon as Ady and I set up home together I was determined that a house was not a home without a cat. Within months of signing the deeds we had brought a pair of little black kittens home. The tore around the place, scrambling up curtains, getting into all sorts of mischief. They were much loved and we were devastated when we lost them both to the busy road we lived on at just a couple of years old. We swore then to only get cats that would be happy staying indoors. We then spent all our weekends visiting cat rehoming centres locally looking for the right cat to bring home. We looked at a pair of semi feral cats at a rescue centre in Brighton every weekend for about 6 weeks. They were fierce, spiteful looking cats who hissed at us every week with flattened ears and glaring eyes. 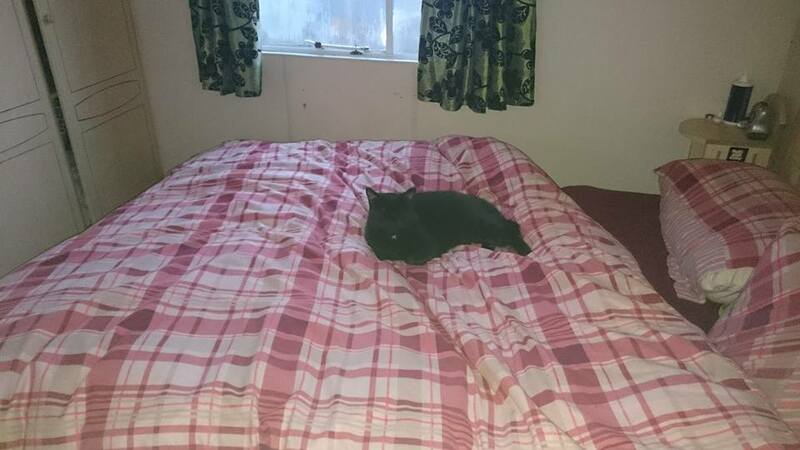 The staff there said they were unlikely to be rehomed and were only suitable for someone with no children or other pets who was prepared to have house cats and spend time bringing them round. That sounded just like us so after a home visit to check our suitability we brought them home. They did indeed take a really long time, years infact, to come around. For weeks they would only come out at night after we had gone to bed, for months we could not get near them, for years one of them lived in the bathroom while the other one chased her back in if she tried to come out. They mellowed though and by the time we had Davies they were a happy pair of lap cats who didn’t just tolerate each other but curled up next to each other to sleep and shared a food bowl. They moved with us from Sussex to Manchester and back and in their latter years eventually did go outside. Sadly that same road spelled the end of one of them, aged about 15, the other lived a very very long life finally going blind and passing away aged about 20. It’s been nearly six years but my lap still feels empty at night when I sit down and there is not a cat curled up in it. We tried taking on a tiny kitten shortly after we moved to Rum but he was too tiny and scared to be a good match with Bonnie as a puppy and we feared disaster would occur if we tried to keep them both in such a small space. He is happily homed in the village with his sister. We took on a pair of brother cats last year from a friend and while they are here still on Rum and happy enough they are not the lap cats I was hoping for. Then a few weeks ago Scarlett and I saw a black cat on a poster in the window of a charity shop when we were on the mainland. She looked just like the black girl cats I have had throughout my life and was looking for a home. We dismissed it as not feasible for us given we were heading home the next day. I had made contact with an animal rescue place to find some peafowl for Ady and had mentioned in passing that if ever a black girl cat came up we would be interested. A succession of phonecalls and emails and a fortuitous mainland visit for me to the beekeeping course a couple of weeks ago meant everything fell into place and along with Ady’s peahens I brought back the very same little black girl cat we had seen in the poster which just so happened to be the rescue centre the peahens were from. Delivered to me at the ferry port by a woman who grew up on the Isle of Rum! The cat’s owner had died and the family had tried to take her on but one of them was allergic to her and so it had not worked out. 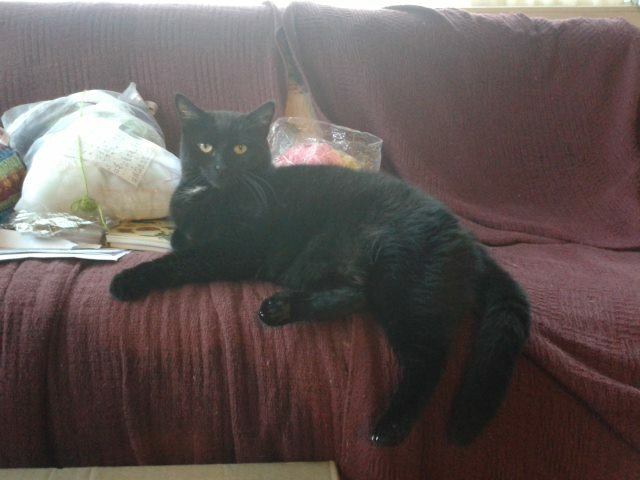 She is a very friendly, gorgeous little black girl cat who has settled into our home beautifully and my lap is empty no more. Bonnie is being tolerant rather than welcoming but they are happy enough to co-exist without drama, she has been outside exploring and enjoys the sunshine and lazily watching the chickens with the odd burst of butterfly chasing exercise. Having allowed her to explore one space at a time we allowed her in the bedroom today where she promptly decided the bed was a good place to hang out. Six years has been too long to not have a cat on my lap or curled up on my bed. I am a very happy Nic indeed. Meet Kira – she came to us with the name Piper but didn’t respond to it so we decided to rename her. The Gaelic word Ciara means ‘wee dark one’ so we have chosen the phonetic spelling Kira which she happily comes to when called. Another busy week with almost continuous glorious weather and of course the return of the midge. Note to self: get the paintbrush out and collect all the dead ones around the window frames ready for setting in resin! Another job to add to the ever growing list. The bell tent is set up and we’re happy with it’s location now, we have ordered some better paracord to make new guy ropes for it so when we take it down to attach those we will re-scythe the footprint and flatten it out a bit more. The camp beds have arrived and I spent some time this afternoon making them up, also arrived are four new chairs. We’re waiting on a cooking set and stove, hopefully arriving this coming week. We have a sink and have pipe on order to organise a washing up station and will be moving the compost loo from the horsebox up to a purpose built shed nearby. 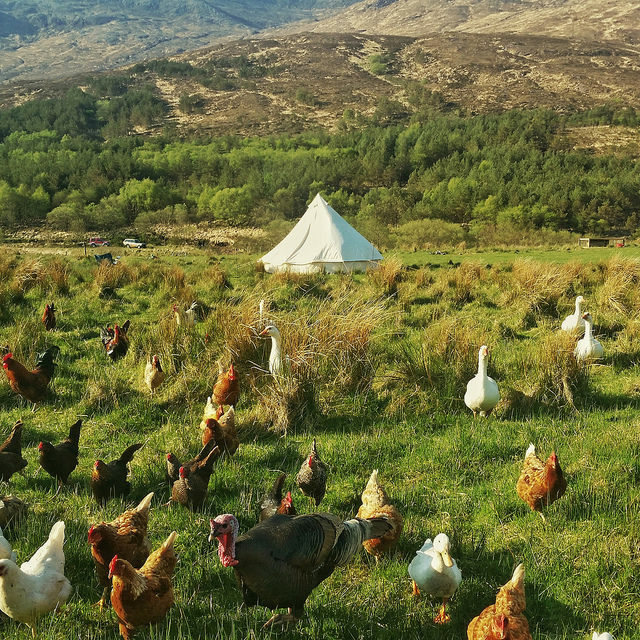 For this year it will probably just be the one bell tent but next year if we have lots of demand to come and stay we will invest in another tipi or two and position them all far enough away from the sink and loo that it gives everyone a little privacy. Now to make it pretty, cosy and welcoming. 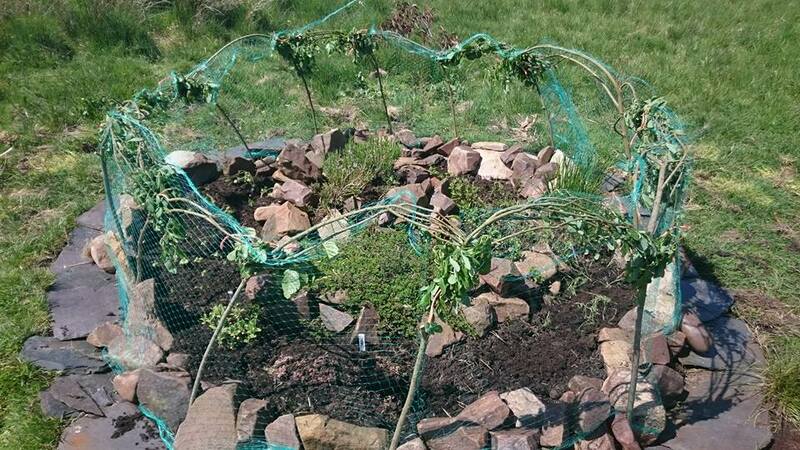 I’ve got the herb spiral weeded, cleared, the slate edging excavated from the grass which had overgrown it – and in a beautiful permaculture move have transplanted the grass onto a patch of bare ground where it has taken. I’ve cut green wood to create a fence and netted it to stop the chickens getting in and transplanted all the grown from seed herbs in from the polytunnel – coriander, dill, fennel, thyme, sage, basil, chervil, parsley added to the thyme, mint, rosemary and lavender which is already in there. I have kept back some basil and planted that up in a pot in the polytunnel to keep going year round, along with some rosemary and lavender bushes. 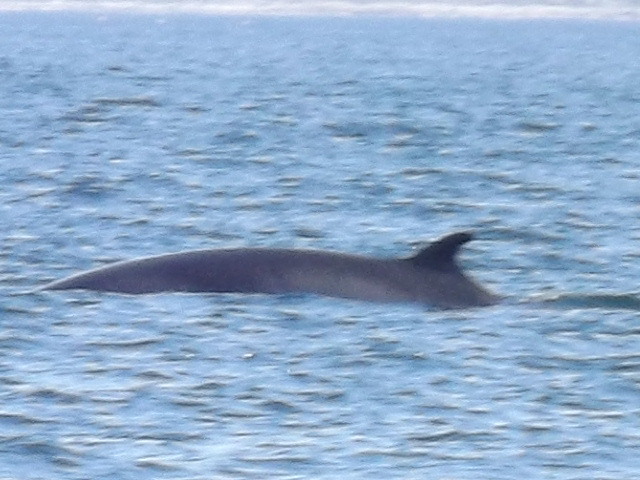 Our usual Sheerwater boat trip on Thursday which netted us a brief sighting of a couple of porpoise dorsal fins and a sea eagle flying through a kittiwake colony in search of a light snack. 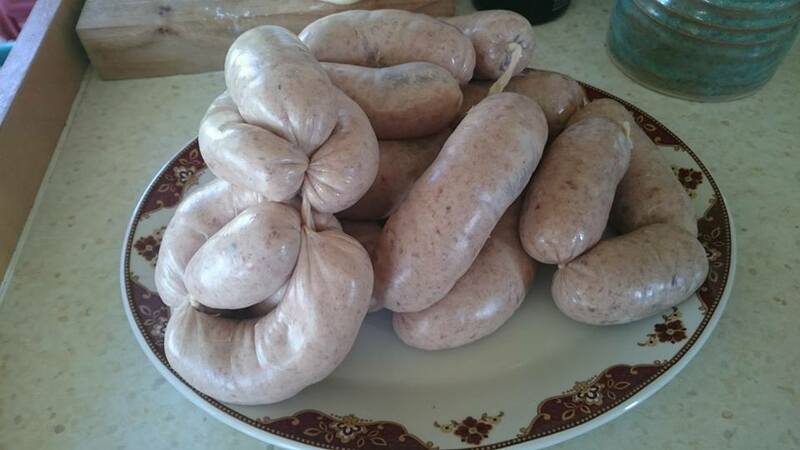 Some sausage making antics this morning finally testing our new mincer / sausage maker which we have had for a few weeks but not got round to trying out before. Really impressed with it, easy to use, easy to clean and did the job just fine. It’s not too power hungry and our generator ran it no problem. 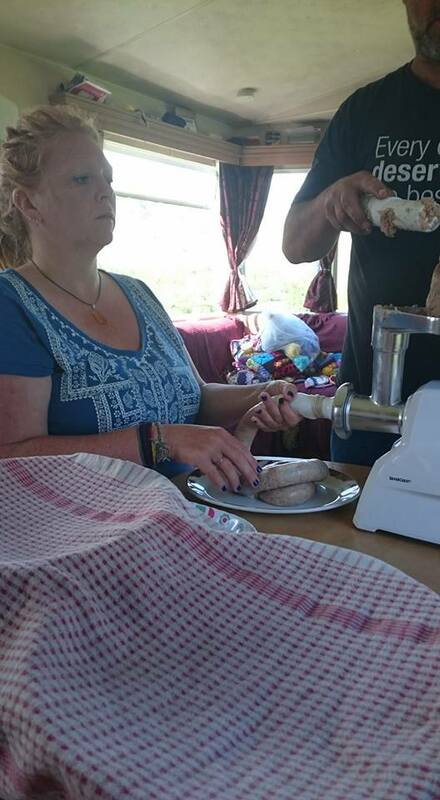 As you can see from my expression I take sausage making very seriously! Which is necessary given the frankly ridiculous process it entails! 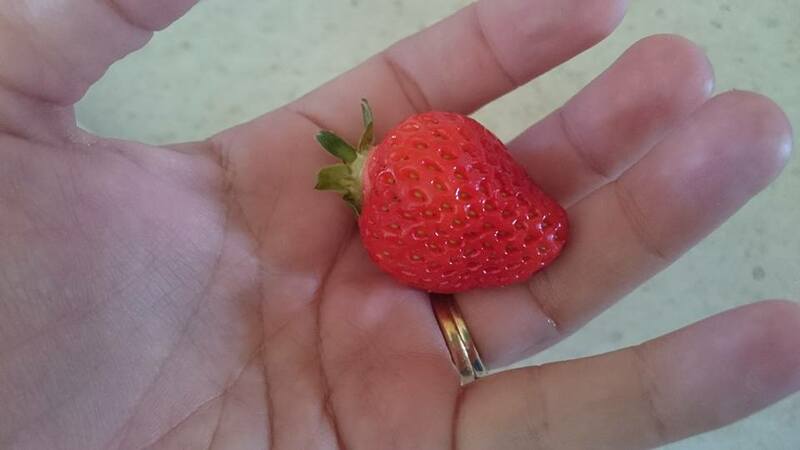 Ady appeared at the bedroom window this morning while I was enjoying an extra half an hour in bed finishing a good book to bring me the very first ripe strawberry of the season and the happy news that another chick had hatched. 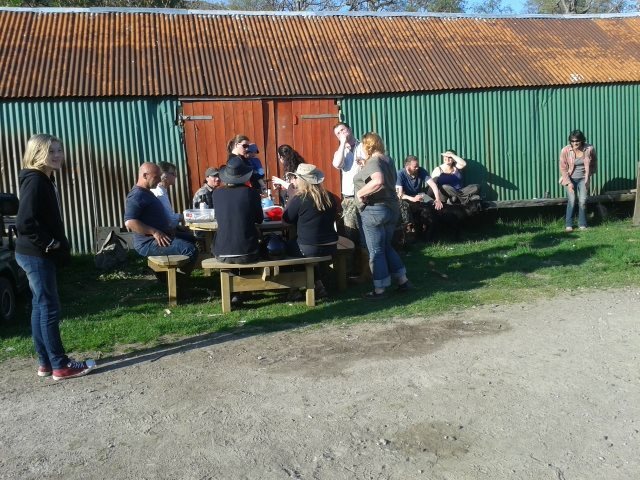 This afternoon we have had friends up to enjoy the perfect midge repelling sunshine and breeze combination of weather. 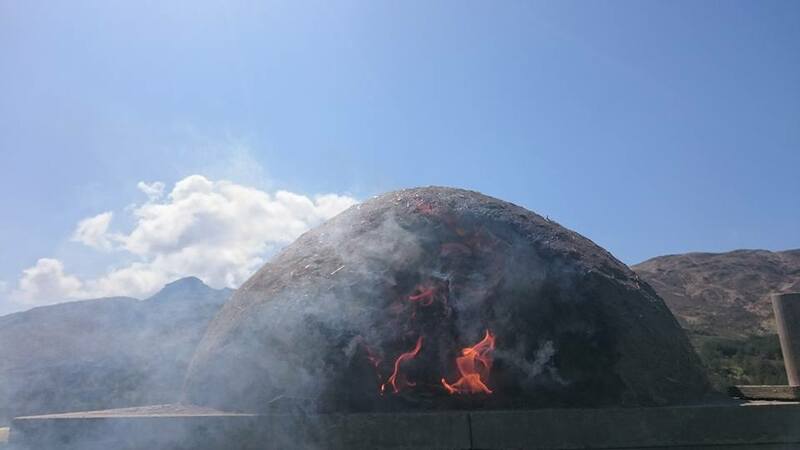 We had the barbecue lit and the pizza oven fired up. Lovely. And where it all began? On Friday we took a boat trip across to Eigg for the day, the island where our adventure with the Small Isles began, on the boat which first took us there. 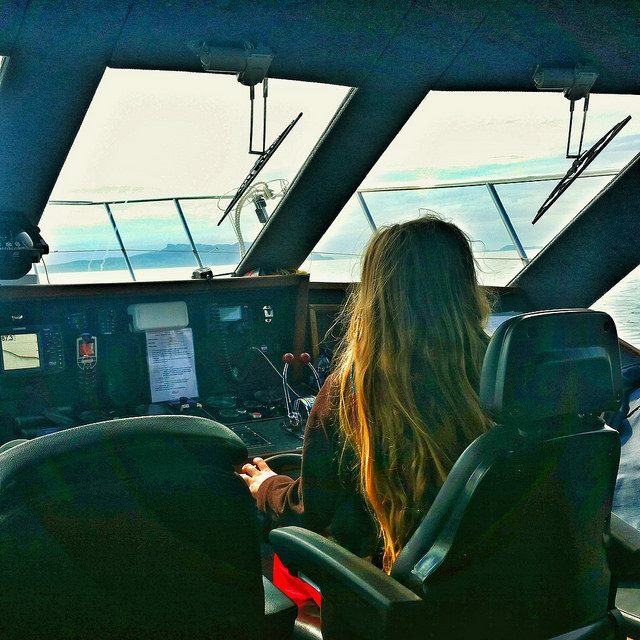 This time though we know the skipper so chatted and drank tea with him, Scarlett took a turn at steering and the landscape was familiar rather than new. 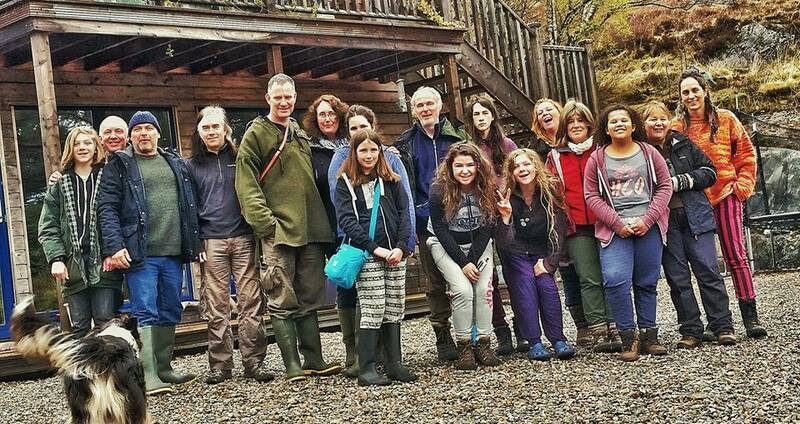 The day before we had given a talk on crofting and our lives in general here on Rum to a group of visiting students. We’d led them around the croft, shown them our livestock and crops and answered questions about our life here. 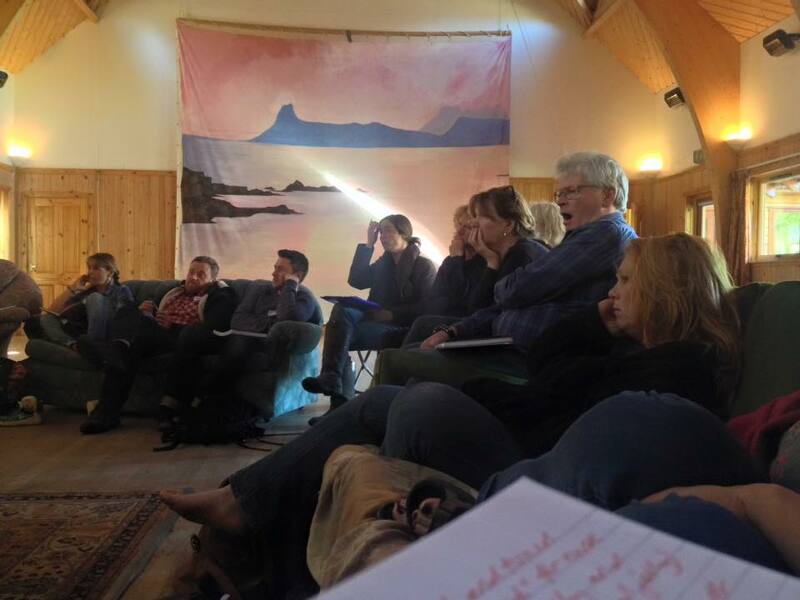 The conclusion to that talk, just like the conclusion in so many of the chats with islanders on Eigg is that while the challenges in this lifestyle can be very challenging indeed the rewards make everything worthwhile. We’ve got Croft 3 In The Shed and the latest venture will be Croft 3 In The Tent. 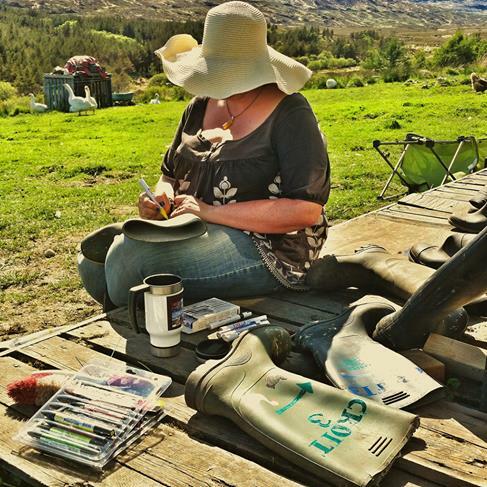 We’re setting everything up this week, today I have been applying a new coat of waterproofing to the tent while Ady’s been scything the spot it will go. Then re-scything a new spot after we changed our minds! Still a work in progress but we’re listed on air b&b and Nearly Wild Camping and working on making a cosy wee spot on a secluded corner of Croft 3, trying to strike the balance between wild and beautiful, authentic and rustic while still being comfortable . 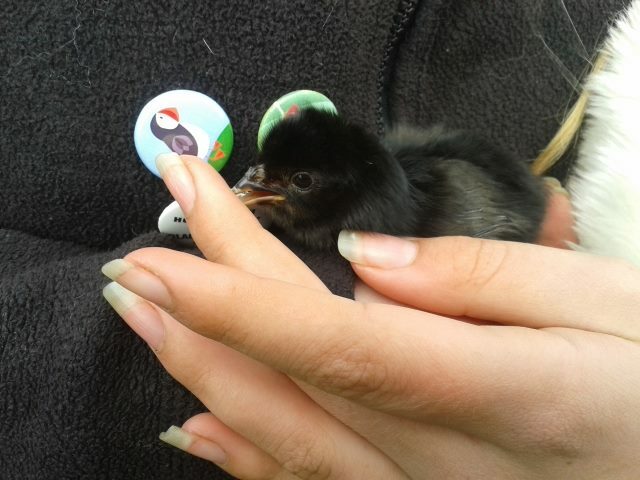 Meanwhile we’re also tending new hatchlings – chick count is at four hens just now with various chickens still on eggs. There is time for Mr & Mrs Turkey to try again this year but for now she seems to be enjoying eating and strutting about again after all those weeks sitting down. He is enjoying having company again! Bob the pig continues to do really well and is firm friends with Barbara, Waddles and BenFogle (the three girls!). 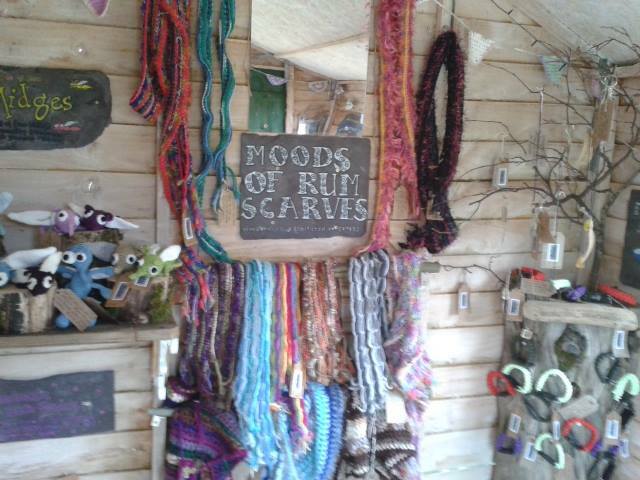 In indoor sitting down moments, of which there are few when the weather is this lovely and there is so much to be doing outside, I am crocheting – more midges (I’ve not forgotten Lynda, a blue one will be with you very soon! ), some little flowers, bugs and butterflies which I’m stitching brooch pins onto and some colouring bunting for the tent. And to lead people here so they don’t get lost along the way? 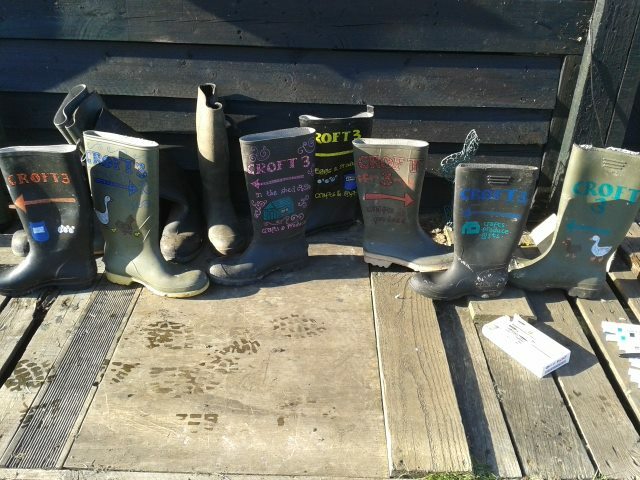 Ady had the fabulous brainwave of creating a welly trail – finally a use for four years worth of outgrown and leaky wellies which have been kicking (pardon the pun!) around which I am painting and we’ll position along the route here from the village to help folk find Croft 3. 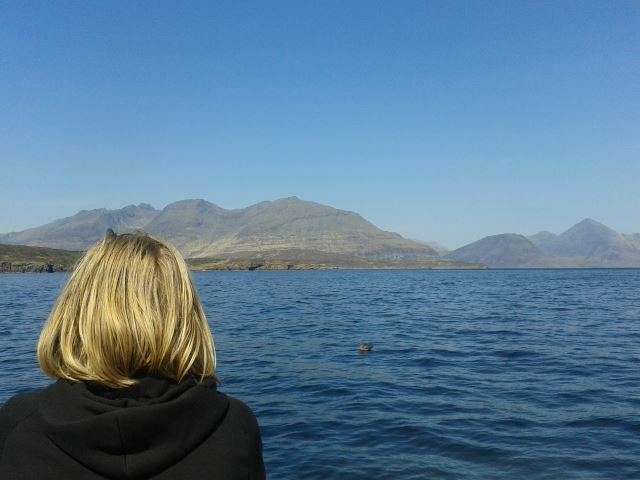 It’s that time of year when we find ourselves chatting to people about quite why we live here… tourists, visitors to the island, volunteers… all have the same set of questions about why someone would want to live on a remote island. As ever we explain our story and how we came to be here, what works for us, what we find tough and why on balance we stay. This weekend we’ve been back at the mercy of nature once more. The turkey chicks who were doing so very well and had reached a week old, were thriving, the mother doing a fine job of keeping them all safe while the male seemed to help out here and there suddenly reappeared on our croft yesterday looking hungry and all alone. All of the chicks nowhere to be seen. The crows and ravens have been really active these last few days, robbing goose nests, hounding the penned chicken and her chicks and hassling the various broody chickens we have around the croft. 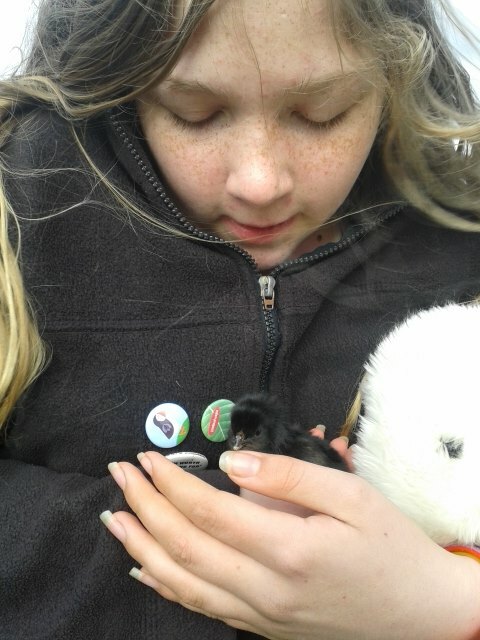 Although we didn’t see it we are safe to assume that the chicks met their fate with the corvids. This makes us very sad. But as I have often said these last four years ‘If you keep animals, you will lose animals’. It never gets easier, there is always sadness, guilt, a pain in your pocket (as after all these are not pets, they are livestock with prices on their heads and costs attached to their being) but most importantly an opportunity to think about what you might do differently next time. With all our birds we like to try and let them raise their young without any interference. After all they have been raising young forever, we have been crofters for just four years. 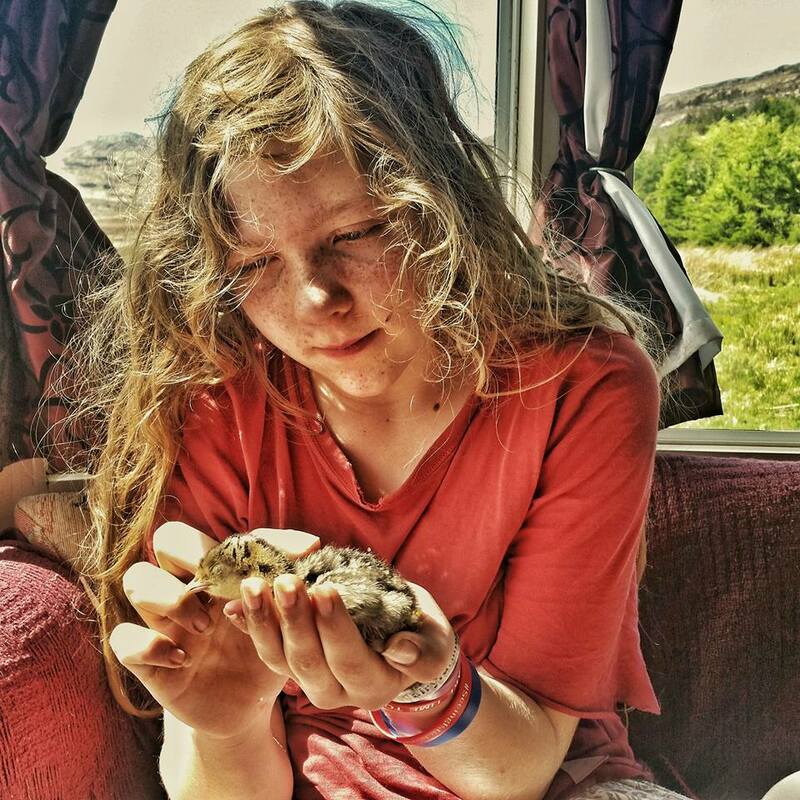 We raise our children without any intervention or folk assuming they know better than we do and so wherever possible we try to allow our animals the freedom to learn themselves and raise their own young. This also has a sound theory behind it that the more self sufficient the adults are in rearing young the more they will pass on that knowledge to their young and the more adapted to life here they all will be. Following this approach we accept that we will lose a percentage of young, possibly a little higher than the farmers usual odds but that they will all have a better life for it and it is a long term bigger picture view for building a resilient, healthy, high welfare brood of livestock. So on the positive side we know both male and female turkey are fertile and breed healthy, well formed young. We know the hen can sit for the broody period, hatch young and take care of the very early stages of motherhood. We know neither of our birds kill their own young (which can happen with some birds). We know that they are no match for the cunning and relentless crows and ravens. This means next time she goes broody, and we are confident there will be a next time, we will let her sit and incubate, hatch and then pen her and her chicks to get them raised to a stage they are no longer vulnerable. Our approach has always been to observe, see what happens naturally without our involvement and then see in what way we could have improved things if at all. In that vein today a broody hen who has been sitting on precariously placed eggs in a corner of the woodshed hatched the first chick. It was in a ridiculous location and would have surely gotten trapped and been rat food so we knocked up a quick house, gathered her, the chick and the remaining three eggs she was sitting on and posted them all into the new house which is within a small pen. She went straight back on the chick and the eggs so fingers crossed we have simply aided nature rather than trampled on it. As part of the whole Back to Business thing I mentioned before we have been looking at our original business plan which included accommodation provision on the Croft. There is a whole spectrum of places to stay on Rum. 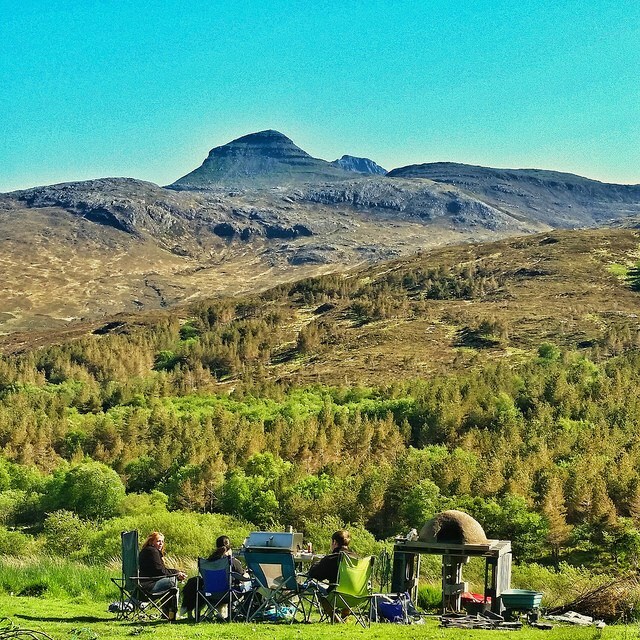 You can bring your own kit and wild camp anywhere, whilst following the Scottish Outdoor Access Code , you can camp on the seashore campsite in Kinloch village which is close to the showers, toilets and village shop and hall. 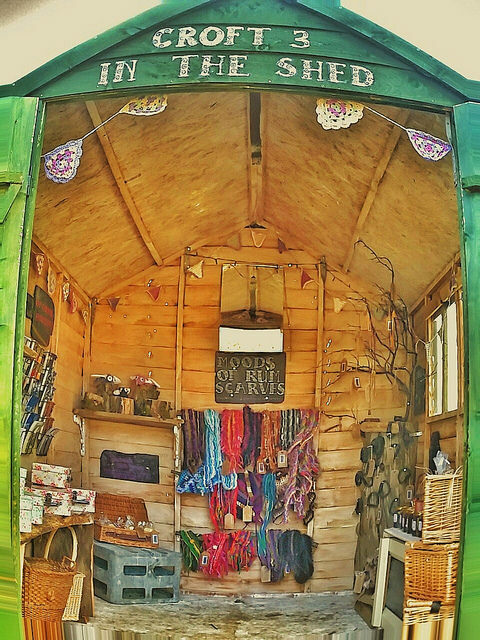 There are various other options including the community owned camping cabins and two private ventures by Rum residents of the Harbour Hut, a gorgeous little hut complete with indoor fire and the newly arrived Gypsy Waggon. There is the community owned Bunkhouse, a state of the art eco build also based in the village or at the other end of the accommodation spectrum is the family run guest house providing full board in luxury en suite rooms. With thousands of people visiting Rum every year, a ferry trip and hike out into the island to carry your kit there is both demand and market for yet more though. Which is where we hope our niche is. 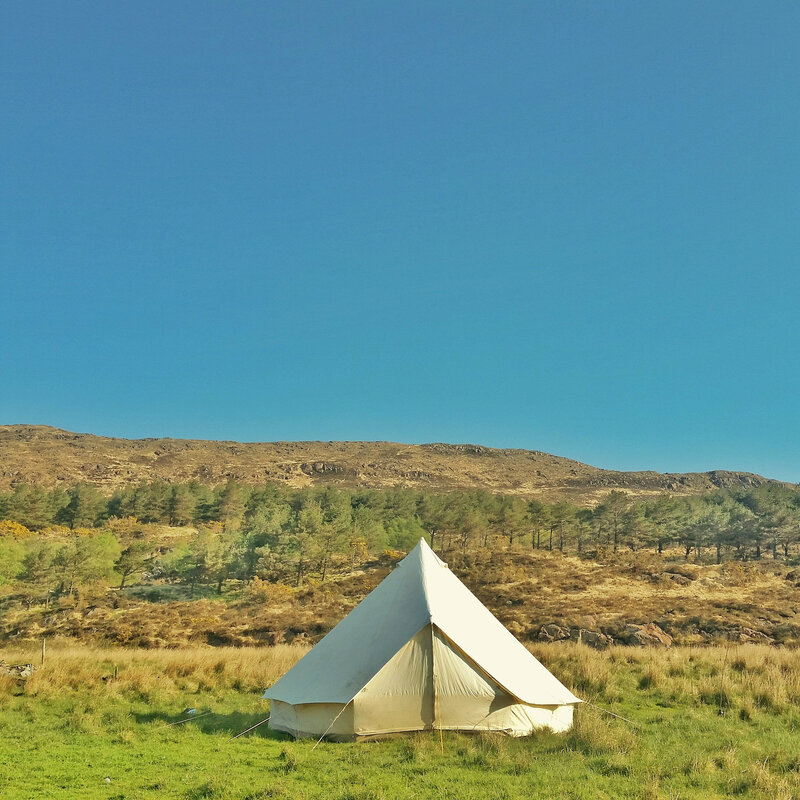 A bell tent, kitted out with camp beds, sleeping bags, an outdoor kitchen, spectacular views, croft tours and the chance to experience off grid life here with us. We’ve set ourselves up on air bnb (check out our listing here) and are hoping it provides another revenue stream and way to meet people, bring more folk to Rum and make Croft 3 work. A full on weekend for all four of us, existing for once in different spaces up to different things. For Ady a birthday – not a ‘big’ birthday, just 52. I asked him in the morning whether he felt like a grown up yet. He said ‘Not really’ to which we had to surmise he probably never will then. That’s a relief, I am not at all sure I’d be any good at being married to a grown up, it might mean I had to try being one as well! 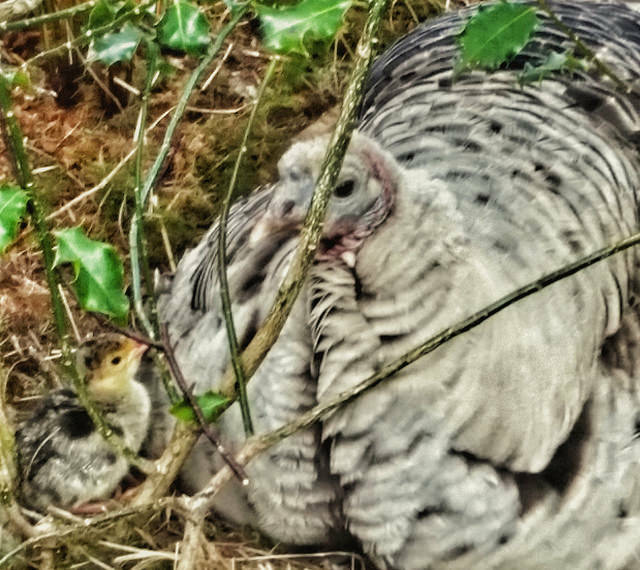 Full on turkey sitting duties – Mrs Turkey duly hatched 8 of her 11 eggs. The other three have disappeared so quite possibly had been cast out or even eaten by her in the four weeks she has been sitting on them. One hatchling was not properly out of it’s egg but a fair way from the nest, which again may have been at Mrs Turkey’s doing. Ady brought her in and Scarlett made it’s brief life comfortable but it didn’t make it. Of the remaining 7 we have lost one but the other 6 are doing well with a fair bit of co-parenting happening with the turkey hen and stag. They are pretty well camouflaged on the croft although obviously the crows and ravens know they are there. We will keep counting them daily and keeping everything crossed for as many reaching adulthood as possible. Ady says it’s been like having toddlers again for the weekend, constantly watching and checking and head counting them all. 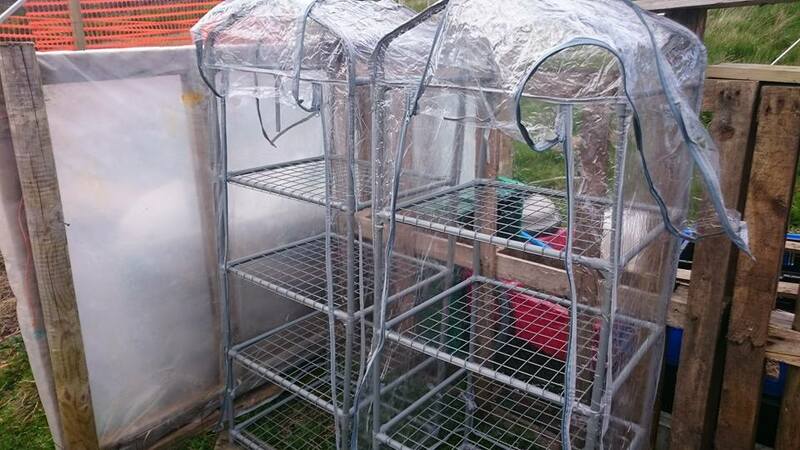 He has also been pen building in preparation of the arrival of the latest Croft 3 creatures – a pair of pea hens. Ady LOVES peacocks and has hankered after keeping peafowl forever so while it is mostly folly to add them to our flock of Croft 3 creatures as they are unlikely to provide us with much in the way of egg sales or meat we do have plans to do some crafty things with the stunning feathers. But mostly they are here because Ady wanted them. The pair of hens have been mated so will lay fertilised eggs for the next few weeks meaning in theory we could hatch more. 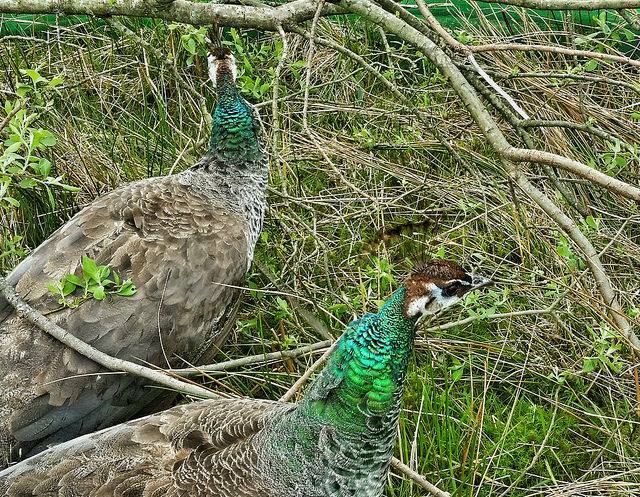 I am also hoping to get a further peahen and 3 peacocks over in the not too distant future. If we’re going to be King and Queen of Croft 3 we may as well have peacocks strutting across our lawns! Davies and Scarlett have been making the most of having friends around over the weekend so been out and about roaming the island. And I’ve been off. Again. This time to fulfil one of my aspirations for this year of learning more about beekeeping. 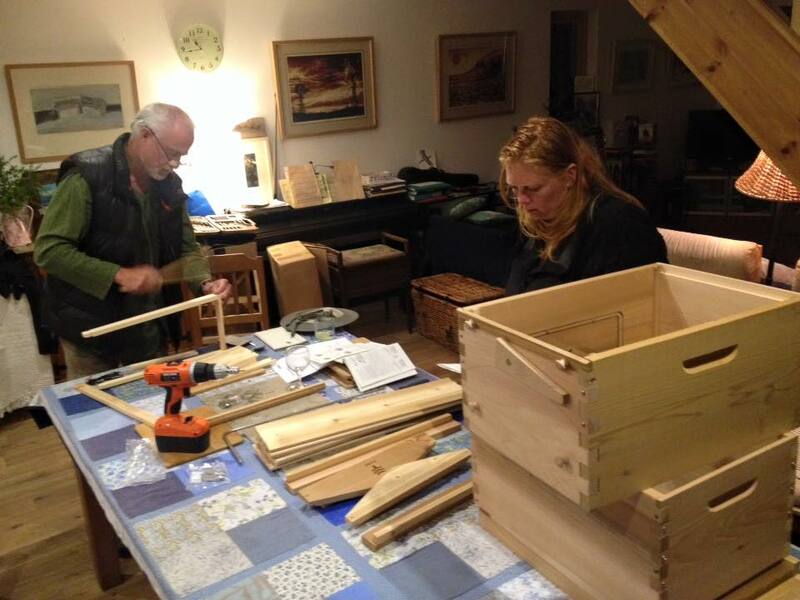 A friend had organised a weekend course with Phil Chandler – also known as The Barefoot Beekeeper. Perfect timing – a stunning, and local (all things being relative!) location at the Glenuig Village Hall, an opportunity for a weekend visit to stay with friends, to learn more about a subject I am really interested in by an inspirational and very much in tune with my general philosophies teacher, the chance to meet and connect with likeminded people also attending the course all handily coinciding with being able to collect the peahens to bring them back to Rum. It all fell beautifully in to place. So I have returned, inspired, educated and enthused ready to take the next steps into adventures in beekeeping. Watch this space for more on that. 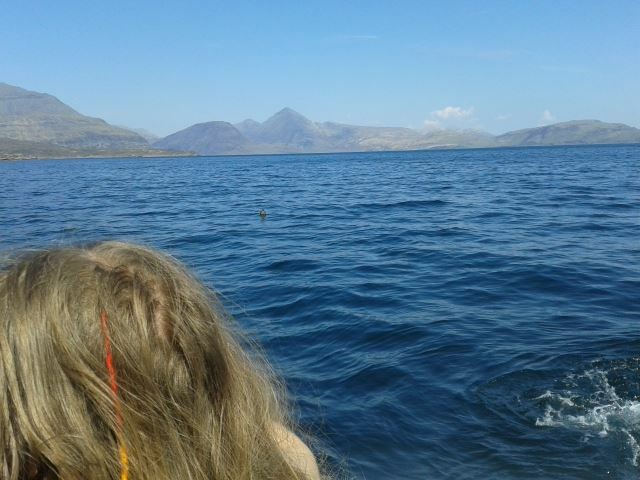 I enjoyed ferry trips out and back sat chatting to people which always both makes the trip go so much quicker but is also a lovely way to spend time – Rum friends on the way out and a regular visitor and ex resident on the way back. The woman we got the peahens from turned out to have lived on Rum in her childhood, which was even more special. As always though it is simply lovely to be home again. In the middle of this most glorious of weeks, sandwiched between sunny days out on the croft seeing peregrine falcons fly above the croft mere hours after we’d been watching a documentary about them, newly hatched chicks running around after their clucking mother, the tentative joy of an empty egg peeping out from under Mrs Turkey this evening (but no chick spotted just yet, hoping it is safely nestled underneath her waiting for siblings), the sheer delight of today’s first Sheerwater boat trip of the season and the triumph of an order for cake coming through by email and splendid sales in the shop, the feel good factor of friends coming out this evening to join Ady for birthday brownies and a beer or two came some sobering news. One of our Rum friends lost a parent, his wife lost a father in law, their daughter lost a granddad. We all here on Rum have lost a man who was a fixture of Rum life for several weeks on end every year as he visited. Life is so very fleeting, so precious and our grip on it so very tenuous. My Dad says that death is the only true certainty about life. We are here such a short time we simply have to make it count, enjoy it, get every last ounce of everything out of it while we can. Chase those adventures, sing that song, be kind, feed your soul, strive for those dreams. Eat the brownies, drink the fizz, laugh with friends. There are fleeting moments on Rum when people visit and get a snapshot of an Eden like place. 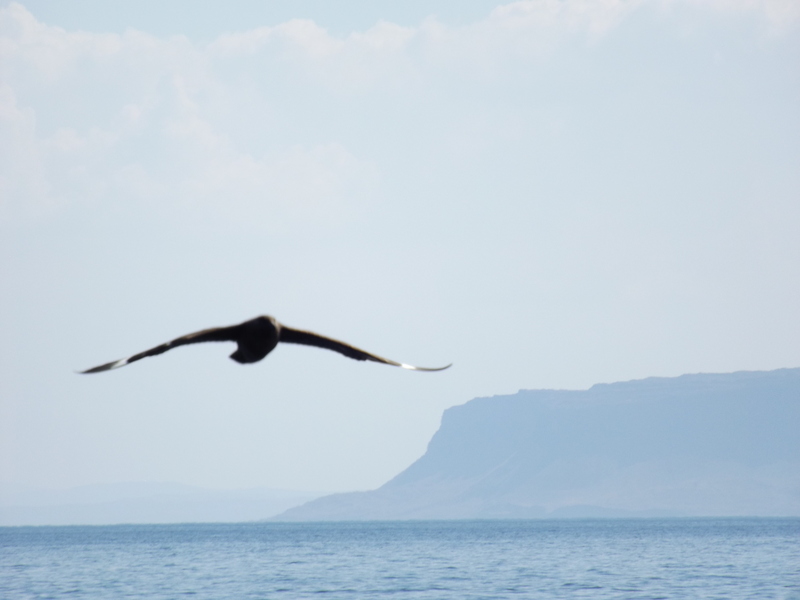 When the weather is perfect, there are no midges, the ferries all run to timetable, skies are blue, seas are calm, eagles soar… you get the picture. I love Rum when the weather is wild, the rivers are raging, it’s dark at 330pm and we’ve not had a boat for days and all the fresh milk has run out and realistically if it were like it’s been this week all of the time then there would be ever such a lot more residents than our current tally of around 30. But that certainly doesn’t mean I have not very much appreciated the amazing week we’ve had. I’ve been outside every single day for hours on end, I have sunburnt shoulders, an aching back from weeding, dirty under my nails. I’ve been listening to the almost constant call of the cuckoo and the cheeping of newly hatched chicks. I have been sowing, thinning, weeding, potting on, planting out and tending. I have raised beds filled with tiny seedlings all starting out in the big wide world outside the polytunnel. 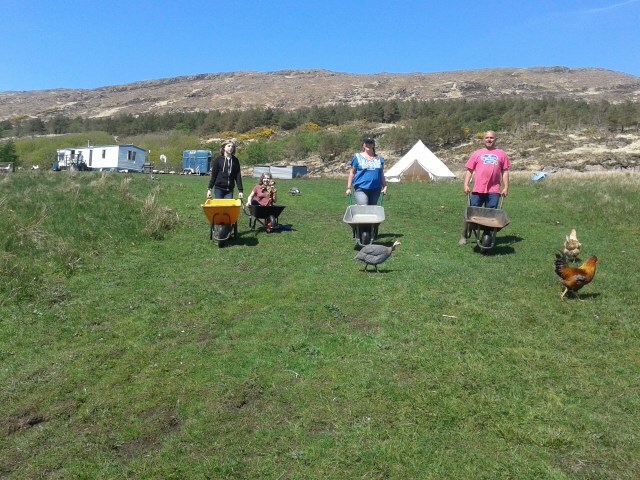 Ady has been spring cleaning the entire croft, stock taking materials and moving useful things around. 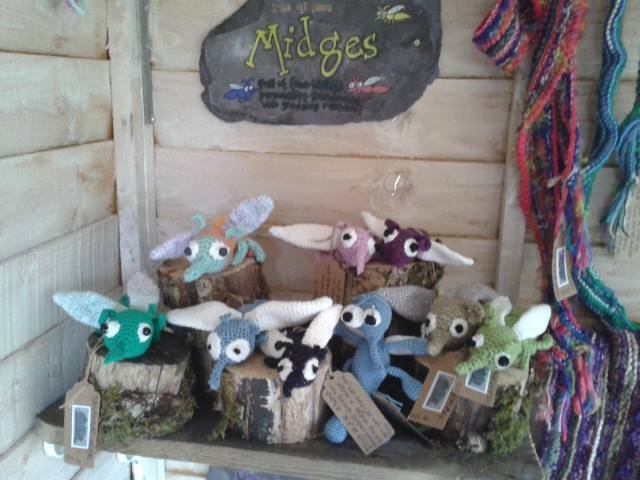 My sweary playlist of songs to sing along to while I work has been abandoned in favour of more appropriate tunes as there seems to be a constant round of visitors walking around the nature trail – many of whom have been visiting In The Shed and making purchases – my first midge sold today! Loads of solar and wind power so Davies and Scarlett have had plenty of online time to catch up with friends and do their various pursuits – gaming, online socialising, watching TV shows on catch up and son on. Scarlett has been playing in the river lots and today we all four spent an hour or so wheelbarrowing our latest big animal feed delivery from the car to the croft. At least five times this week one of the many passers by the croft, or indeed the man who just walked straight through the croft earlier today – have called to us ‘you have the perfect life!’. This week I rather think we might. Our croft tenancy here on Rum was a hard won victory in a competitive environment. 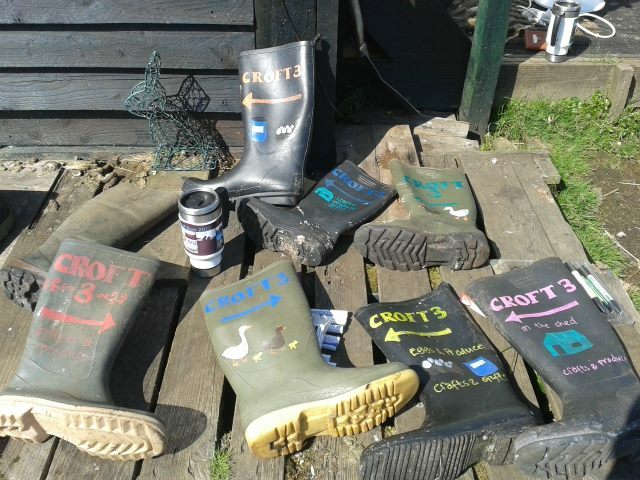 The newly created crofts were widely advertised and we had to apply, submitting a business plan and meeting set criteria. Our initial application was scored on a points basis as the Community Trust had very specific aims in mind when the crofts were created in terms of who they were looking to attract to live here on Rum and what the crofts would be used for. For us the process of putting together an application and business plan was a very productive one, almost regardless of whether our application for this croft here on Rum was successful or not. It cemented what we wanted to do next after our year of WWOOFing, made us look at how we might earn a living and work the land, showed us our skill / education / knowledge gaps to create a list of things we needed to work on and really cemented for us what we wanted to do with our time, energy and money. 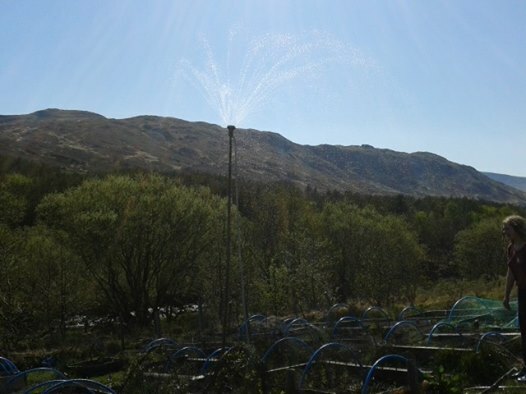 We were asked for further information to support our application and then invited for an interview where we were grilled at length by directors of the trust, the chairman and local councillor, the development officer and a representative from the Scottish Crofting Federation. It was far from a done deal and we were aware at every stage that we may not be offered the tenancy of the croft. Four years on I have been revisiting that original business plan. I will be very honest and confess that for a long time it sat in an envelope and was ignored. The reality of life on Rum was so very, very different from the theory. The challenges were more diverse, more testing and more unexpected than we could ever have thought possible. The breadth of skills we needed to acquire, knowledge we were lacking, philosophies and ideas to be challenged and rethought. 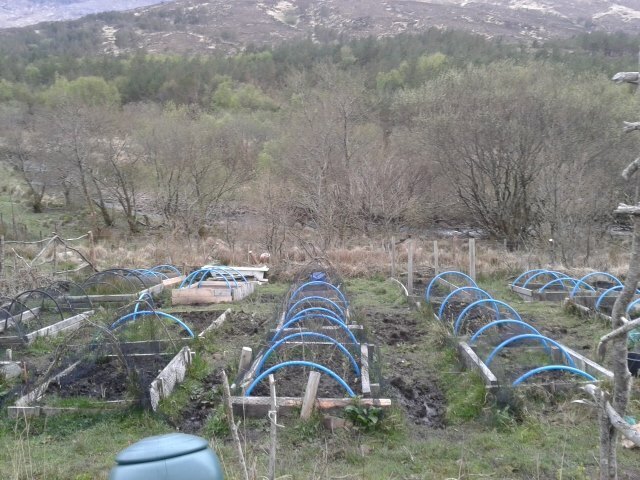 I had assumed that a super productive allotment on a small patch of fertile south coast land would translate upscaled ten fold onto an area of croftland on Rum, that the lack of foxes and other ground predators would mean our chicken and duck keeping triumphs down south would be improved upon, that our captive market of 40 fellow islanders would all be interested in buying our produce with no competitors growing food already. We thought our conservatively planned timescales allowing for no real progress in year one and small growth in year two would mean we would be ahead of our own game. Oh how naive we were! We didn’t allow for so, so many things, we had no idea. Rum is the place that Davies and Scarlett are growing up but I consider it the place that I have grown up too. It’s the place where the world didn’t bow down infront of me and do what I expected it to. It’s the location for things not happening as I anticipated them doing, it’s the place where sometimes things I intended to happen didn’t. It’s the backdrop of lessons learnt, u turns made, crashing realisations, harsh realities and brutal home truths. On Rum you take responsibility and are accountable. On Rum you are effectively naked in as much as no one cares where you came from, what car you drive, what house you live in, what clothes you wear. You are stripped bare and have only yourself to answer to, to blame. It’s taken four whole years to fully understand this. Four years to come to terms with what we are and are not going to achieve and what is actually important anyway. This year we have changed our focus and are very much concentrating on making Croft 3 a sustainable place for us to make our life and support ourselves. Our original business plans were about diversification, opportunities for all four of us to do the things we loved and learn new skills, to make money from our efforts. Self sufficient is about more than just growing food. Four years on we have slowly worked towards creating a business which supports the four of us and we still have a way to go but it feels as though we are making bigger steps in the right direction. We have built a brand, created a market, made an outlet and worked on marketing, advertising, getting the word out. We are trying to make the most of the opportunities here and all we have learned while we’ve been here. Croft 3 In The Shed is doing really, really well. We have already noticed patterns emerging in what products are selling well and which price points seem about right and which might need tweaking. 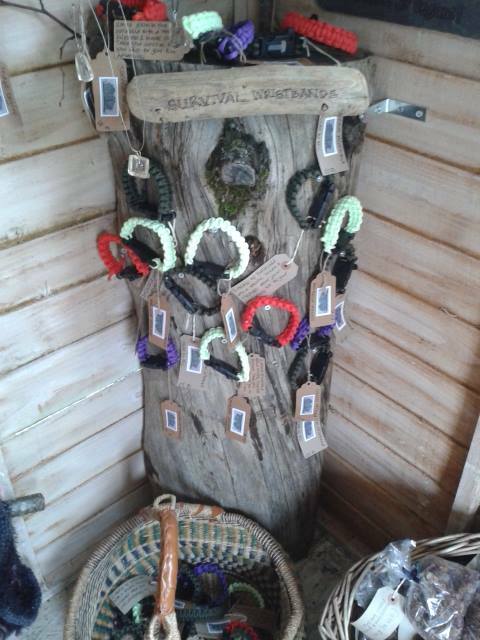 Some of the things we are selling seem to have interest online or even on other islands so that is something to explore further. We are still selling our eggs through the shop and to locals, just this week I have had repeat orders for baking from people who visited last year and ordered bread and cakes from me then. We have ideas for more product lines to introduce over time and while Ady and I put our retail experience into practise Davies and Scarlett are learning heaps about packaging, pricing, labelling and presentation. We have various other ideas for ways we can bring more income in from the croft, more of which to be elaborated on as we start doing them or learn more. Along with bringing in more income we are also looking at ways to reduce costs. Our single biggest expenditure is animal feed so this year we have made a real effort in growing more crops for animal feed to see if we can reduce next years feed bill. It’s an exciting time and the thrill of making sales, getting enquiries and coming up with new ideas for revenue streams is making us all excited and thriving on the massive opportunities available. Or so it has felt lately. I have been on the Calmac ferry for the last four Wednesdays in a row! When we first moved here to Rum we had the idea that we would seldom if ever go off – the effort of organising animal sitters, the cost of going off, the stress of being away all felt huge. We had decided that we had moved here and here we would stay and that we needed to find all our needs met here otherwise this was not the right place for us. I confess to observing fellow islanders who frequently headed off the island and feeling they had it all wrong, a foot in both camps and a heart in neither bridged between island life and the mainland. I am still inclined to feel that frequent trips off Rum don’t really work for us. It remains stressful and expensive (despite lower ferry costs) and tricksy to organise. There is always, always a price to pay for having been away no matter how wonderful a job croft sitters or friends do of feeding the animals and keeping an eye on things. The fact always remains that no one is as good at being you as you and in your absence not everything will get done or happen as it would when you are here. All that said we’ve been off again! We had a birthday party to attend – friends that Davies and Scarlett were the bridge to making last year but have become firm family friends were celebrating a significant birthday and we were invited along to the party. 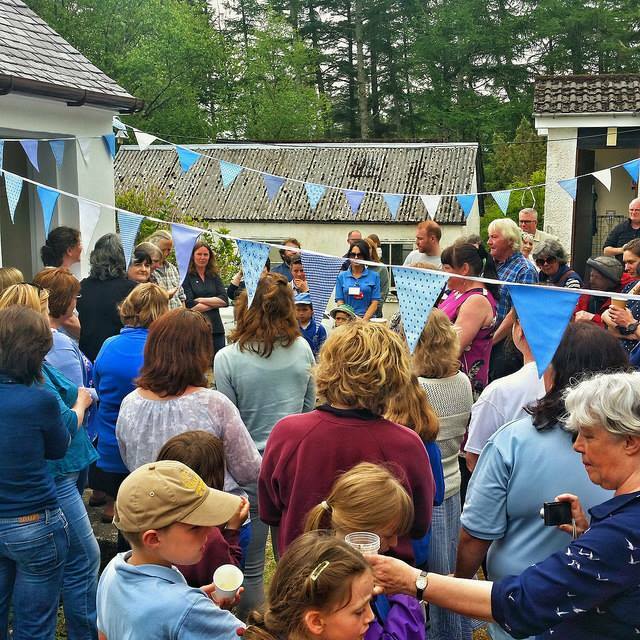 It was a great weekend with loads of socialising, singing, eating, drinking, laughter and chatting. Plenty of making new friends and enjoying part of a big group. We had a fabulous time. We had planned to be off for just a couple of nights but Ady had a hospital (routine, check up) appointment come through which we were able to rearrange to tack on to the end of our trip off so we stayed off a little longer. For the extra nights we headed south a tiny bit to stay at our favourite camping pods on a little farm that we stayed at the night before we moved to Rum. Four years ago, different people right on the very cusp of a whole new adventure, complete with our shiny red 4×4, a horse box loaded up with almost everything we owned and a tiny just collected from the breeder collie puppy Bonnie. The woman who owns the farm and camping pods just so happens to have a son who lives in the same road as my parents back in Sussex so despite this only being the second time we’ve managed to go back to stay there it feels like visiting an old friend. It was lovely to see her again and catch up on each others news of the last few years and a place filled with nostalgia and memories that very much feels like part of our journey. I read our entry in her visitor book from that first visit and it really made me smile remembering us then. We made the most of the extended time off as the hospital appointment was very brief despite meaning an additional two nights off Rum and drove down to Oban for the day. This allowed for supermarket shopping and a cinema trip, a real treat! 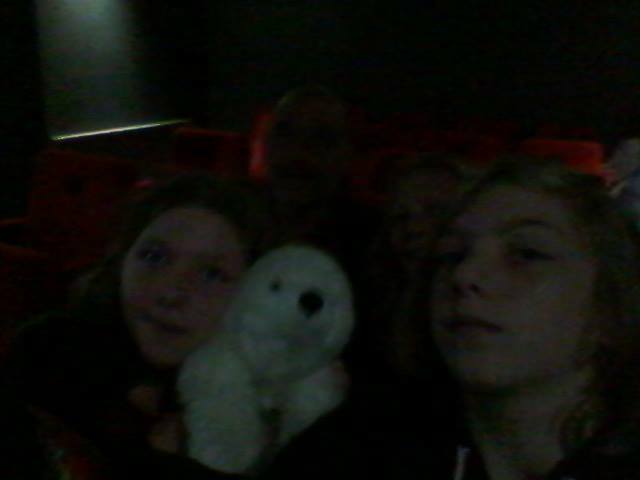 We watched Jungle Book in the tiny 20 seat screening room and thoroughly enjoyed the whole experience. An early start to get back to Mallaig with everything crossed that the boat would run as it was very windy. It did but just one call to Rum so we considered ourselves fortunate to get home and had already provisionally booked extra nights accommodation just in case. 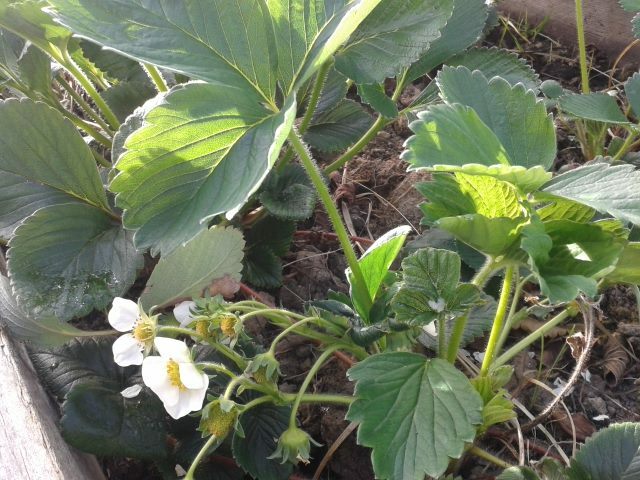 Since being home we have discovered not only flowers but shed petals and forming fruit on the strawberries, countless tiny currants starting on the fruit bushes, loads more germinated seeds in the polytunnel and the emergency lighting propagators and most excitingly of all the first newly hatched chicks of the year. The heady combination of all of these new signs of life and progress and success along with having talked to so many people these last few days about our adventures, hopes, dreams and ideas and quite why we are doing things rather differently to most people has all helped with reaffirming and reigniting the passion. Every spring I say I have fallen in love with Rum all over again and every spring it proves to be true.